The announcement by INEC,that the Osun state election conducted on Saturday,22nd September2018,was inconclusive and the fixing of 27th of September for a so called rerun,is a dangerous subversion and travesty of the electoral process,a blow to our hard earned constitutional democracy and an ominous sign of the farce to expect in 2019-subversion of the people’s will. INEC has earned for itself the inglorious reputation of holding inconclusive elections (Kogi,Bayelsa,et al);and working in cahoot with the ruling APC party,always eager to do its dirty electoral bidding,to commit daylight robbery of votes.This they have just done to Adeleke’s votes to defeat the will and legitimate franchise of the good people of Osun state. I wholly condemn this ludicrous mockery of our electoral process and constitutionalism.There is no basis whatsoever,whether in law,constitutionalism,or morality,to have declared the election inconclusive.The Constitution of Nigeria and the Electoral Act ONLY recognise LAWFUL AND VALID VOTES in declaring a candidate winner of an election.This presupposes that some votes would be unlawful and invalid. Consequently,where votes are cancelled or invalidated for any reason howsoever,including for being invalid and unlawful,such votes are immediately and automatically cancelled,deducted and consigned to the dustbin of history.In any case,it was not wholesale results in the election that were voided and cancelled. 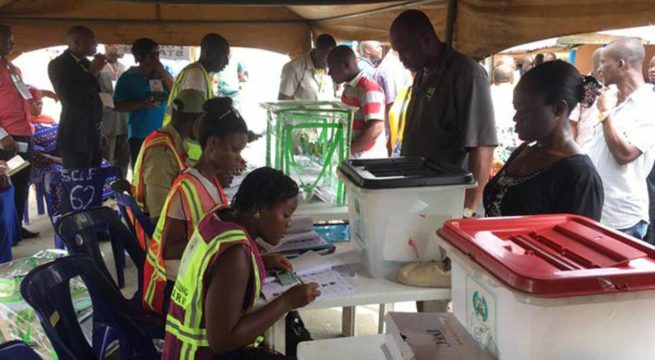 Only votes that INEC had adjudged illegitimate due to irregularities were voided and cancelled.This cancellation and voidance of illegitimate votes effected all the political parties,not just APC and PDP,but especially Omisore’s SDP,whose two strongest fortes in Ife axis were badly effected.Such voided votes are ignored and unreckoned with,for they are a non sequitur. They are as dead as dodo.Having failed to viciously intimidate and rig the elections as they did in Ekiti State,due to the people’s courageous resistance,the APC has now used its electoral arm,INEC,to do the unthinkable,that which is clearly illegal,unconstitutional,immoral and a brazen assault on our sensibilities and constitutional democracy. In Osunbor v Oshiomhole (2007) 18 NWLR(part 1065) 32,cancelled votes had been counted and added to PDP/Osunbor’s scores.The courts,up to the Supreme Court,held that when votes are cancelled,they are not reckoned with in determining the outcome of such an election. The courts thereafter deducted the invalidated votes and this gave victory to Oshiomhole in the hotly contested election.To avoid disenfranchisement of eligible voters,only votes in areas where election did not hold at all are considered for the purpose of calculating total votes.Some people may argue,ignorantly,in my humble opinion,that section 69 of the Electoral Act or other guidelines issued by INEC justify this electoral perversion. I will quickly remind such people that those provisions or guidelines are subject to the overriding authority of the provisions of the Nigerian Constitution,which is supreme.The Constitution is the Kabiyesi,Eze and Emir,in the hierarchy of Nigerian laws.All others are like Bales and Chiefs,that must bow before this king. The provisions of the Constitution therefore clearly override the provisions of the Electoral Act and any guidelines issued by INEC,by virtue of sections 1() and 1(3) of the 1999 Constitution.They are consequently null and void to the extent of the inconsistency.See the celebrated case of Nyesom Wike v Dakuku Petersude (2016) 7 NWLR (part 1512) 574.It is clear to me that INEC ‘s decision is more of a political hubris than one anchored on solid laws,whether the Constitution,or Electoral Act. Collation of all the results in Osun had already been done by INEC in accordance with section 27(1)(a)(v)) and (c) of the Electoral Act, 2010,as altered.The state collation was completed under section 27(d) and the results ought to have declared Adeleke the winner under section 27(f),having polled 256,219 majority votes to beat APC’s candidate who scored 255,309 votes. The provisions of section 69 of the Electoral Act(which in any case,is inferior to section 179(2)) of the Constitution,were thus amply satisfied.The constitutional,legal and moral profanity that INEC has thus engaged by ordering a repeat election is to invalidate the people’s valid and legitimate votes,in strange preference for legally voided illegitimate votes that no longer mattered or counted. TheReturning Officer’s duty was simply to announce the winner,having declared all the results,and not to usurp the role of the Election Petition Tribunal,by altering the texture and tenor of the outcome,through its order for a rerun.What happens to the legitimate votes of the other candidates who will not participate in the rerun and their electors’ will,one may ask? By the way,why is INEC changing the goal posts and revising history because APC was roundly defeated in the election? Recall that during the Kogi state bye elections of August,2018,over 19 000 votes were cancelled and voidedThis tremendously outstripped the 12,000 votes difference between the two leading candidates.Yet,in Osun state,only 3,498 votes were cancelled in Orolu,Ife South,Ife North and Osogbo LGAs.How can that affect the humongous votes ganered by Adeleke? PDP and Adeleke should immediately head for the courts to seek an order of mandamus,compelling INEC to declare him winner. Alternatively, he can approach the Election Petition Tribunal with all the votes cast,urging it to declare him winner.He has won his people’s hearts with his performance in the Senate and mesmerising dance steps of a teenager. INEC,I beg of you,don’t kill our hard earned constitutional democracy on the alter of corruption and official comprise of the ruling party.